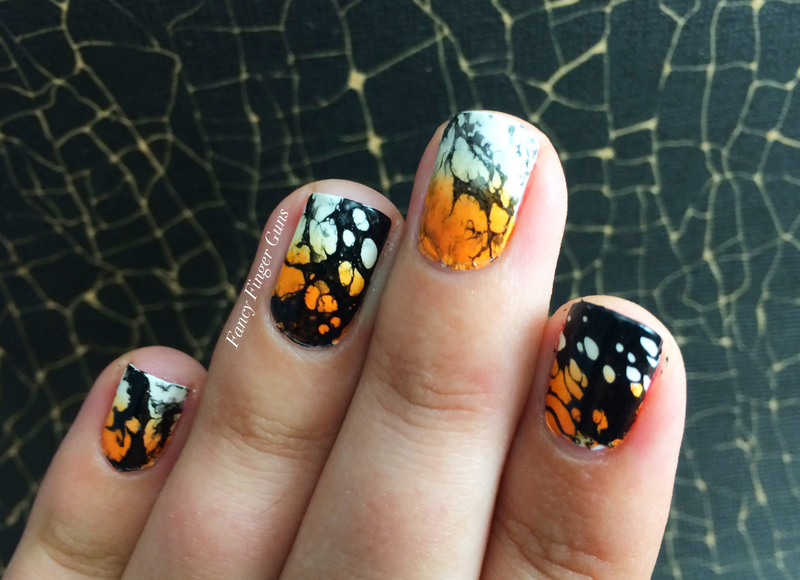 Halloween Mani #11 – Water-Spotted Gradient! Hi everyone! 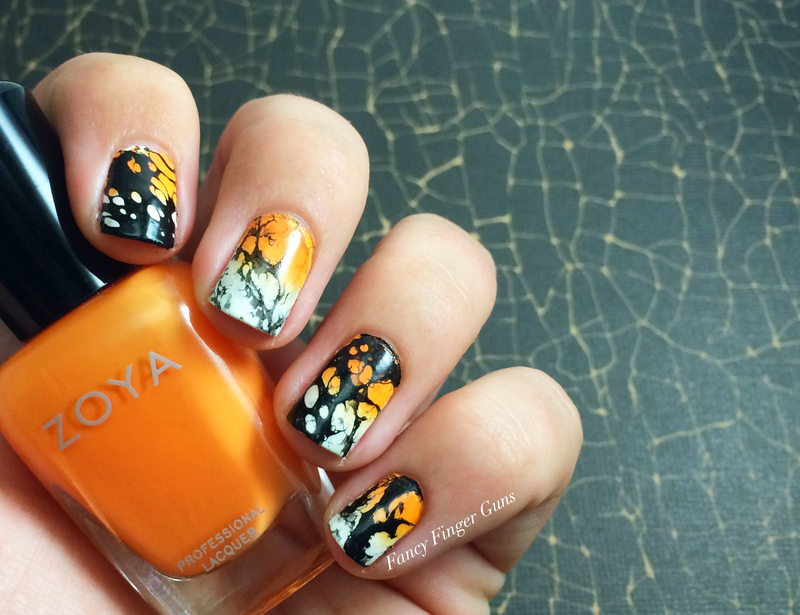 I’m chugging along with my Halloween manis, and this might be one of my favorites yet! 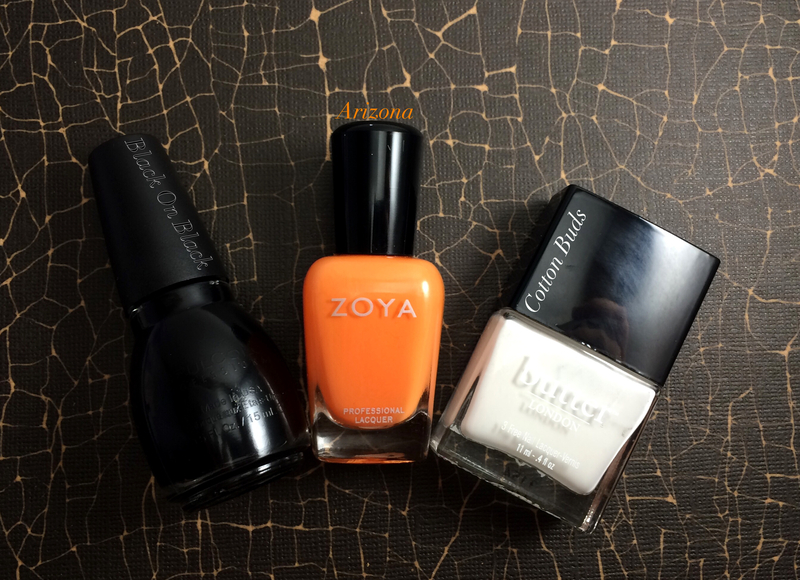 First, I put some of my latex stuff all around each nail for easy clean up, then I did the gradient – after two coats of Cotton Buds was dry, I did a gradient with CB and Arizona over top each of them, with Arizona at the top. I gave that about ten minutes to dry, then did the water spotting. So there are way better tutorials elsewhere, but the basic rundown is: I filled a Solo cup with lukewarm water, added one drop of Black On Black, and when it spread out I sprayed a little tester perfume spritzer in the middle so the polish got cool, weird spots and swirls, then lowered my nail into the polish and swirled away the excess with a Q-tip. After pulling my nail out of the water, I removed the latex (which meant I barely had to do any clean up – thank Yeezus someone thought that up!) and let it dry for a few minutes before adding a layer of top coat. I was annoyed by how much the black almost completely covered my pointer finger, but now I kinda like how different each nail’s coverage is. This is a really fun look, but man, I need to find another way to do it – spraying that perfume makes the whole area smell SO strongly for a full day after, but I’ve tried it before using just alcohol and it didn’t do anything. Hmmmm must research. I like how this came out so much, I took wayyy too many photos! I think my thumb is my favorite, even though it’s super sparse. 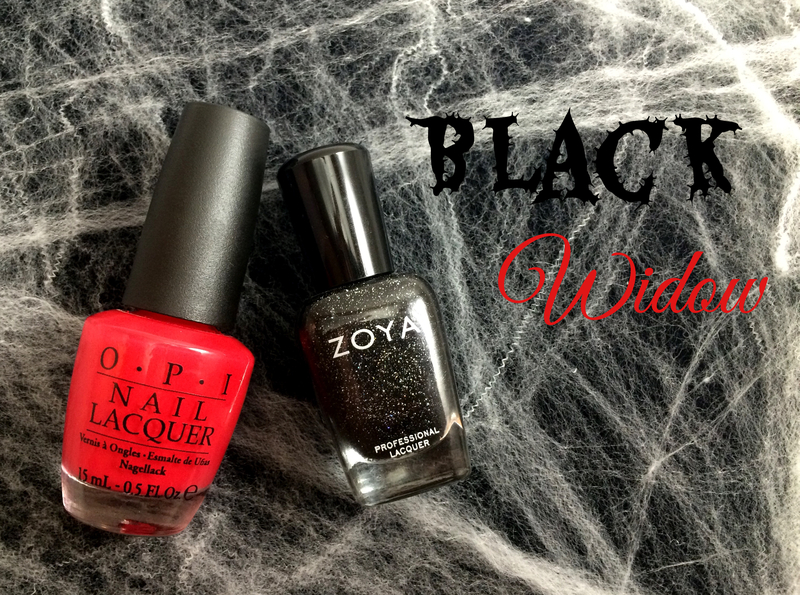 Halloween mani #10 – Glam Black Widow! 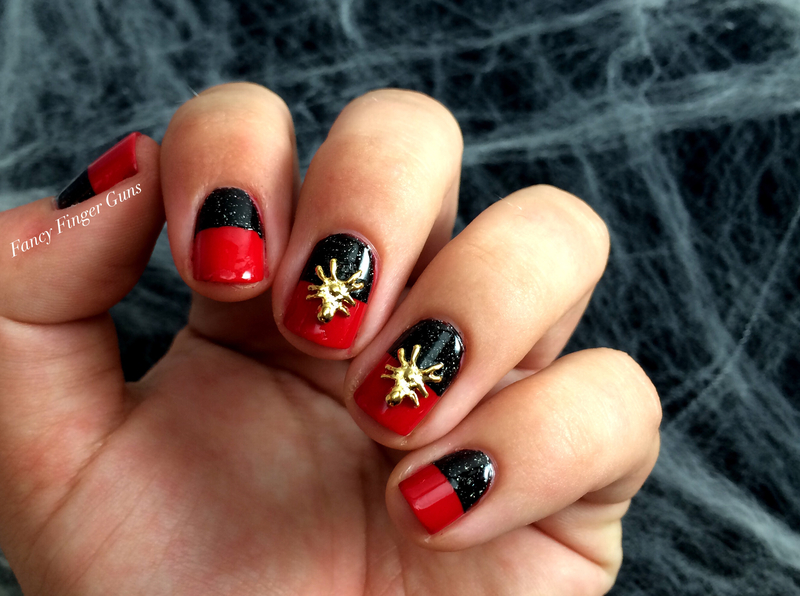 I wanted to do something with deadly-looking colors, so I chose to use the black widow spider’s red and black color scheme. I used a base of Color So hot It Berns, although I really need a new red – this one is a bit sheer and takes forever to dry (I dinged two nails even after waiting 15 minutes), but I got it for free a few years ago and I hardly ever use red, so I always forget to try a new one. Anyway, when that was dry, I applied a piece of washi tape horizontally across the nail then painted on a layer of Storm. I looooove these gold spider charms! I got them last year but forgot to use them for Halloween, and I’ve kind of just been saving them since. I don’t usually like anything so big or chunky on my nails, but these are super awesome and glam!